A quick bit of advice today about one of the biggest trends at wedding receptions today. The disposable camera still makes an appearance every now and then which is fun, but it’s heyday as the method of catching some fun extra photos at wedding receptions are certainly numbered. Enter, the photo booth! Photo booths can add great entertainment to a wedding reception if set up in such a way that they add to the party — not distract from it. From past experience, the best way to set up a photo booth is to somehow tie it into the dance floor area of your reception. Having it sit at completely the opposite side of the room from where the “party” is simply creates two smaller, less energetic parties. This doesn’t mean that right on the edge of the dance floor is required, but keep it within a short walking distance. The photo displayed here is from Kyle & Alyssa’s July 21st wedding this past summer. If you were looking at this room as we had it set up while facing the head table you’d have seen this: head table, dance floor in front of it, guest tables on either side of the dance floor, my small equipment setup to the left of head table and the photo booth further to the left of me. This setup also allows the disc jockey to positively interact in small little ways with some of the guests as they head over to have a photo taken. Myself, Natalie and Tim of Shift Photography had a lot of fun getting people jazzed up for these photos! Finally, will you hire a stand alone photo booth or one operated by your photographer? My choice is very much in favour of the photographer operating your photo booth. The lighting is often far superior and the image quality without question. As well, you’ve got a professional who can often suggest fun or unique poses. Having said that, some of the new stand alone units have the unique ability to connect with Facebook and email live at your wedding. This adds a whole new level to photo booths! 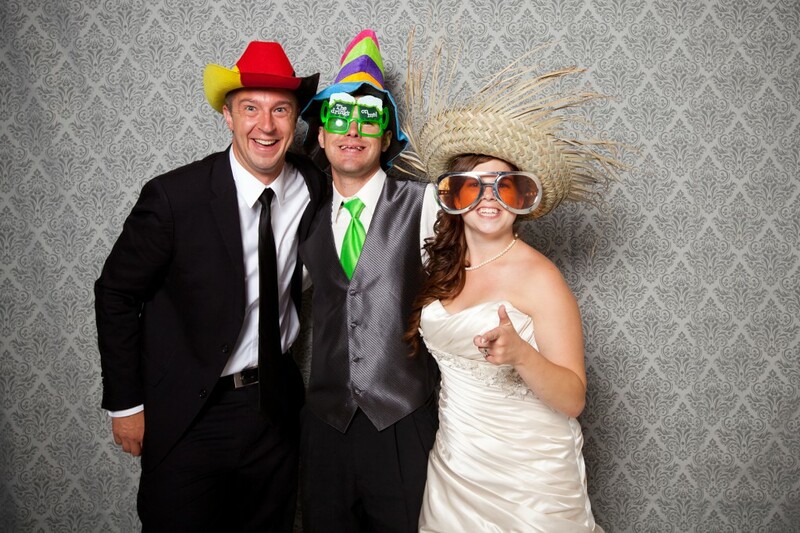 And as you can see, the right props can also add to the photo booth energy! This was such a fun reception, as you can tell. Thanks to Natalie of Shift Photography for letting me share this image here.